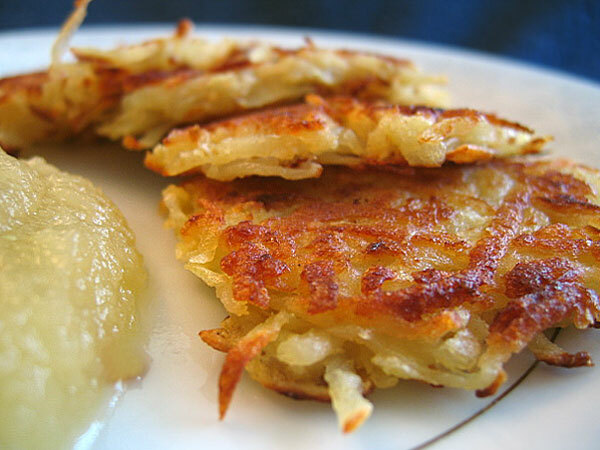 Of all of the dishes we ate during Jewish holidays growing up, latkes remain high up on our list of favorites. I mean, come on - they’re fried potatoes! There’s a secret that mrb’s mom taught him early on in his latke making career that has stuck with him, and it’s the key to producing super crispy, slightly sweet, and always perfectly browned latkes: use the potato starch. Here’s how it works: Before you grate your potatoes, line a colander with cheesecloth and place that inside a large bowl so that there is space between the bottom of the strainer and the bottom of the bowl (it doesn’t need to be a ton of space, an inch or two is fine). When your potatoes are grated, place them in the cheesecloth, wrap the cloth up around the grated potatoes, and wring out as much moisture as you can into the bowl. Do this a few times, and then let the potatoes sit, covered in the cheesecloth in the colander (which is still sitting in the bowl), and wait a few hours. When it’s time to make latkes, take the collander out of the bowl and pour off the liquid at the bottom. You’ll see a beige-looking paste remains stuck to the bowl - that’s the starch! Mix that goop into your latke batter and you don’t need any other starchy binder (leave the matzoh meal out!). Fry your latkes and experience the crispy, starchy bliss. Mmmmmm, starch.